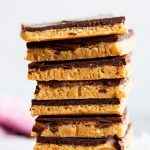 5 Ingredient Peanut Butter Bars are an easy snack or dessert you can put together in no time. You don't even need a food processor for them, and they're healthy with all-natural ingredients! Melt butter. Add peanut butter, sweetener and baking blend and stir well. Spread in a lined 8x8 inch square baking pan. Freeze until solid. Melt chocolate chips in a double-boiler water bath. (Optional: Stir in 1/2 tablespoon butter for shinier chocolate.) Spread over peanut butter layer. Freeze until solid, then cut into bars. One serving has around 4.5g net carbs according to MyFitnessPal.